One problem with the 5X everywhere technique was that it was easily available to everyone, and it created a sort of “Tragedy of the Commons.” As more and more people rushed out to buy Vanilla Reload cards, the cards became harder and harder to find. Now, regardless of whether the deal was killed by bloggers, FlyerTalk, or, more likely, by thieves who found ways to illicitly activate and steal reload cards, there are now many in our community looking for alternatives. What we have now is a new game with a new playing board. Before, I told you step by step how to win. That contributed to the aforementioned Tragedy of the Commons. I realize that repeating history is inevitable, but let’s try to avoid, or at least delay, that fate this time. With the new game, I’ll describe the rules and the pieces, but I’ll leave it up to you to figure out how to win. Earns valuable points within bonus categories. For a nearly complete list, see “Best Category Bonuses“. Earns a valuable sign-up bonus after required spend is met (see “Best credit card offers“). Earns bonus points or perks with high spend. A great example is the Delta Reserve card and the Delta Platinum card. Both award bonus miles and elite qualifying miles to big spenders. In fact, I use these cards to maintain high level elite status with Delta without flying (see “Mileage running, from home“). For more examples of cards that offer elite status for high spend, see “Preparing for Miles“. This may be the hardest part of the game. You need to find a store that sells reload cards and will let you pay with a credit card. If your goal is to increase spend to earn a signup bonus, or to reach a high spend threshold, then it doesn’t matter what store you find. Try supermarkets, drug stores, convenience stores, and gas stations. The interesting thing here is that there doesn’t seem to be a set rule for where you can find and buy reload cards. For example, some Walgreens stores will let you buy Vanilla reload cards with a credit card, but other Walgreens stores have registers that are hard-coded against it. If your goal is to earn a high category bonus (e.g. “5X everywhere”), then this step gets a bit more complicated. If you can find a reload card in a store that gives you a category bonus, then you’re all set. If not, then an alternative is to go to a store that gives you a good category bonus (such as Office Depot) and buy a prepaid Visa or Amex card. Then, use that card elsewhere to buy a reload card. Vanilla Reload cards are not the only reload cards around. Below is a roundup of all of the cards that I’m aware of that can sometimes be bought with a credit card. Vanilla Reload cards cost $3.95 each and can be loaded up to $500. Use the card to load an American Express Bluebird card and then you can use the Bluebird card for everyday expenses, to pay bills, to transfer money to your bank account, or to withdraw money from ATMs. 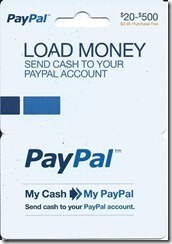 PayPal Load Money cards cost $3.95 each and can be loaded up to $500. Use the card to load money to your PayPal account. From your PayPal account, you can use the money for online purchases, to transfer money to others, or to withdraw money to your bank account. Green Dot MoneyPak cards cost $4.95 each and can be loaded up to $500. Use the card to load a compatable permanent prepaid card such as the AccountNow Prepaid Card (which has bill pay features), or load directly to your PayPal account. You can find more information about this card here. PayPower REloadit cards cost $3.95 each. Some of these cards can be loaded up to $500. Others can be loaded up to $950. Use the card to load a permanent prepaid card such as PayPower, NetSpend, AccountNow, etc. Of all of the reload cards in this list, this is the only one that I haven’t personally bought with a credit card, but I’ve heard from quite a few others who have succeeded. You can read more about buying and using this card here, here, and here. Despite the recent news from Office Depot, reload cards are a big, growing business. I expect that the list of cards shown above are just a drop in the bucket compared to what is now or will soon be available. Prepaid account (or PayPal) shutdown: In order to use the reload cards shown above, you need a reloadable prepaid card or a PayPal account. If you load money onto one of these accounts, then completely withdraw all the money, and repeat over and over, you run the risk of getting shut down. Your activities will appear to be fraudulent. Plus, the bank behind the account would probably not be making any money from you and so would be happy to lose you as a customer. Killing the deal: If you go hog wild buying and liquidating reload cards, you may inadvertently draw unwanted attention to what you’re doing and the deal may be killed either locally (i.e. your local store will stop selling the cards) or nationwide. Some people went hog wild with Vanilla Reload cards because they believed the end was in sight and they wanted to get as much out of it as they could before the deal died. I don’t think this is a good approach. It increases your chances of account closure and it ignores the fact that there are, and always will be new great deals. Take your time, go at a pace you’re comfortable with, and be ready to adapt as things change (which they will!). If you’ve gotten to this point in the post and are totally confused about the information presented above, that’s OK! Yes, normally I walk people step by step through point-earning opportunities. And, I will continue to do so with many other deals, but not with reload cards. If you don’t understand how to take advantage of the game presented here, start with simpler schemes or network with others at in-person events. A good way to find in-person events near you is to keep your eye on FlyerTalk’s Community Buzz forum. I have no doubt that many readers have already been playing the game described above. Others will rush out to different stores to see what they can find. If you learn about new useful products, please let me know. If you find a great store for buying those products, consider keeping the details for yourself and some friends. Thank you so much for your discretion. If only other bloggers had the same conscience as you do. From now on, if I sign up for any new CCs you will be the only person I give my referrals to. Problem is the attention generated by BB is now going to swing to all these other formats. Everyone has tasted the drug and is looking for the next fix. The amount of inquiries I have had in the last 48 hours of Reloadits is more than I had in the 4 months since I first blogged about them. I have always been one for sharing but after seeing the kind of abuse of the VR cards I can’t help but feel this will get abused too. Bob: No, you need a PIN to load bluebird at Walmart. You could use the Vanilla Visa to reload bluebird online, but then you’ll have to pay the 2% fee and load only $100 per day. CCORD: That’s very strange. It sounds like there was a problem overall with that Target Amex card, or maybe the cashier rang it up incorrectly? frequent churner: Thanks for the tip! I think you or others have told me that before, but I forgot. The picture I found of a reloadit card clearly has a $500 limit. Do you have an image of a $950 limit that I could use instead? Or anyone else? Please email the image to me or point me to a site that shows it. Thanks! I found and tried to buy an Amex by Target reloadable card. Target would not allow me to load it with a Vanilla Visa gift card. When I decided to use a credit card they reentered all the info and Amex would not let the purchase go through. We tried a second reloadable card and it would still not go through. FM, You are definitely a better pedigree of blogger. Keep up the good work! More like, let then account closures begin. There a reason why these aren’t sustainable, because companies are loosing money to buy these points for you. People cry when they’re stuck holding cards they cant liquidate. Your better off churning credit card applications.Let’s face it, its unrealistic to fund the round the world trip using gift cards. Recommend you recalibrate your blog to something more realistic. I think one thing that people forget is that regardless of how many miles/points are given away there are only a limited number of FF Awards available. So the more points that are easily available the harder it will be to find a way to use it. None of these companies are in the business of giving away things free to, in many cases,marginal or non-customers. @FM — Reloadit cards can often be found in $950 denominations, which reduces their acquisition cost in half. Have anyone try the PayPal Load Money card? It seems easy one. Would the PayPal card work if bought via CC to load your PayPal account and then “direct deposit” to Bluebird? I was doing about $1k a week of reloadit and it appears this company is getting very aggressive with those who are trying to just game the system. They will freeze your account and make it a nightmare to get your funds back. I spent 2 week just request my funds back once my account was blocked, then another 20 “Business” days before they sent out my funds. In all took well over 6 weeks to get my money back from them. I had only done about $1k a week for 2 months. The same thing happened to numerous other people I know. The 950 ReLoadits and the 1000 MoneyPacks are cash only. I havent found a company that will allow the purchase w a debit or credit card. Been that way for yrs. Stopped after the grocery store started implementing “Cash Only” policy. One thing I’ve never tried is using the self checkout at Lucky’s to see if the reload cards are hard coded not to be allowed in their registers. One issue with the other prepaid cards is that the merchant that usually carries these cards do not let you buy it with a CC – it is hard-coded onto their system.. For example with the Greendot Card, I tried to buy it at Ralphs, using a CC won’t go through and it was cash only. For the Paypal Card, I went to Rite Aid and tried it with a CC, it also wouldn’t go through – the clerk said cash or debit only. Which merchants did you have success in buying these with a CC FM? Would really appreciate it if you can share. Thanks! I found Green Dot MoneyPak cards at my local grocery store, but it was cash only. I am still waiting for the V-reloads to hit the CVS stores in the Atlanta area. Great stuff, keep up the good work! Good post, let’s hope others don’t keep going down the path of illustrated, arrows-and-circles, step-by-step instructions. Teach a man to fish, and all that. Can you refer me to NetSpend? Excellent post! Really like the balance you managed to maintain. good post , as always !!! @FM, If I use a Citi Dividend Card for 5% cash back at CVS to buy a $500 vanilla reload, will Citi charge it as a cash advance? I’ve read somewhere that they do consider gift cards/reloads as a cash advance. Thanks for your help! I didn’t have any trouble using a Citi card at OD to buy Vanilla Reloads. I can’t promise that it will be safe everywhere, though. thanks for the info. you’ve done your job, if someone abuses the system & get shut down they will still come back & blame you. so common these days. deal with your own suffering, it’s a lesson. don’t expect someone to tell you everything, learn & use your own head. is the $5K per month reload limit per calendar month? This is a smart approach. Excellent post, FM. I really wish people would realize you are one of the few people out there generating ideas. If only you were the only one generating the revenue. It annoys me that people really cashed in on your deal. They were the ones getting 5x the referral bonus they deserved and abusing it 🙂 (not that I support the ad hominem attacks going on at MMS). @Lbotez, you run the risk of Citi treating your purchase as a cash advance. FM, can you buy any reload cards at Kohl’s or Best Buy with a credit card? ibotez: I bought $2500 worth of VR at OD with my Citi thank you card. I’ve had no problems with Citi. FM, what do you think of loading up WF with prepaid visas from OD? Seems like places are pulling the reloadit in the Atlanta area. Knew of a few chains that were selling them, but the stores for the past 3 or 4 weeks are no longer stocking them. Thanks for killing this in the Atlanta area! @Jim: Everyone was riding the Vanilla Reload Gravy Train. Not many were working the reloadits. I doubt reloadit is pulling cards due to VR abuse. anyone know if it’s possible to buy amex/visa gc’s at best buy? i went to one in cerritos today and only saw best buy and itunes gift card. trying to max out on chase freedom 5x bonus. @imissnetspend: Just like what was written in “office depot discontinues vanilla reload cards” it was stated that almost weekly he got emails stating they were being pulled from stores. Stores/chains see a spike in sales and they get scared, they shoot first and ask questions later. This is the beginning of the end of this one now. There was an area of TN I used to drive to get these as well, that chain which I won’t name has instructed all stores not to sell with credit cards as of this past weekend. I am hoping they change their mind, but as of now this stuff is dying fast. The game is on??? No, it isn’t! Look at the questions by your faithful readers. Most of them are in over their heads. They are ABSOLUTELY clueless!!!!!!!! Went to my local grocery store in Atlanta and they only take cash for greendot moneypak. The tough part is finding a program that can withstand the pressure of 100’s if not 1,000’s going after the reloads. Seems like enough that stores will panic and say fraud. I dont think there was a lot of fraud at OD just a panic that multiple people all over the country were coming in and buying 10-20 packs to reload. OD not knowing what was going on got scared and scaled back only making the demand and interest go sky high. @Webazoid – Best Buy does not sell the Amex/Visa gift cards. But they do sell Amazon gift cards – a store where I have no problem spending tons of money. Can I use any of those reloads to reload a Bluebird? I have been doing Reloadits for several months at my grocery chain and coast right through self checkout paying with CC, though store policy is cash or debit. I have no doubt the store policy will eventually be programmed into the registers though as has been an outcome for others I have talked to in their grocery chains. Blackhawk network is well aware of this game now based on their interrogations of people who have had frozen accounts. The above poster is right, it is no picnic to have this happen to you and they are relentless in their investigation and questions before they release funds. Expect to be required to fax in every form of identification you own. It is probably only a matter of time before the CC loophole is shutdown 1 store chain at a time, so enjoy while it lasts. I think Jim is spot on. There was a big herd of zombies going after VR cards and now they have run out of meat they are turning their attention to Reloadit’s. Another one bites the dust. Enjoy while you can. Adam K: Only the Vanilla Reload cards can be used directly to load Bluebird. Others can be used indirectly by loading a debit card or PayPal account first. Has anyone managed to use a CC to purchase Green Dot reloads at CVS? I tried today, but the cashier got some invalid tender error message. “The Rebate Offer Number you entered is no longer valid for online submission. Please enter the rebate offer number from your rebate redemption form. Million Mile Secrets has gotten ahold of it and will spoon feed the details. This deal will be dead by the end of January. Darious is a plague on the community. I can find 0 information on the Interwebs about it. According to PayPal, the only reload option they offer is via MoneyPak – which you also have listed. BH: They’re pretty simple. You can use them to load up to $4K per month directly to your PayPal account. BH: Lots of stores sell them. The trick is finding a store that will let you pay with a credit card. OMG people. Figure some of this out yourselves. He said he wasn’t going to lay it out for you. The original OD deal was not exactly 5%, but more like 4.21% max because of the activation fee of $3.95. What I am getting at is OD deal is still alive, but reduce to 3.22% max cash back. Can you still buy regular visa or amex card $500 value at OD? I went to office depot today and they had 10 or so Vanilla Reload Cards on the rack. Tried to buy a few and the system wouldn’t let the clerk scan it. He called over a different guy and he had the same result. Then he called the manager and the manager didn’t know why it wouldn’t scan either. Based on what I saw on the screen, the cards were removed from inventory since as the UPC was invalid. Apologies if this has been covered elsewhere. Went to local CVS near my work…both has stacks of greendots. I went to the cashier and carried 1 greendot, and asked if i can pay it with credit card. She said no, cash only. I got the BB and loaded it with a couple VR’s. Now I’m trying to pay a bill. Anyone know if the website’s having trouble today? It allows me to enter the company name but there’s no button to click for the next step. I clicked on “contact us” and have a hold time of more than 10 mins. Long hold time was the same problem I had when called to register the card. Others have trouble with pay bill feature? The problem was as simple as a little “.” or clicking the return key. Spent 1/2 hour+ on the phone with Bluebird. Rep first had me download and install Google Chrome. That didn’t fix it. She then put me on a long hold only to come back and say she had another person on the phone with us and told me I needed to contact my ISP because they were blocking something on the website. I went to the Apple store and explained what was going on. Love that place! We logged in to Bluebird and I filled in the name of the payee. Still no place to click “submit” so the guy had me just hit return. This brought up a note that name had to be alphanumeric so we got rid of the . after Inc. Proceeded fine from there. Payment on it’s way. Tried buying a Paypal card at CVS with Credit card, result – Failed. @FM do you know if, regular visa gift card can be loaded to WF prepaid debit card? Adnan: It depends on the gift card. There’s a FlyerTalk forum about the WF card where people talk about which gift cards work and which don’t. Joe: He could just fess up and tell them that he paid with credit and send in the receipts. Or, he can call them and say he doesn’t want to bother with receipts and they should cancel his account and send him his money back. They are saying that they can not release any money from the account or cancel it until the receipts and other info are submitted. I guess the real question is whether fessing up can lead to something worse than a closed account and all of his money being being lost? Could it lead to legal action? My fiend has my Paypower prepaid card account (which is affiliated with Reloadit packs) freezed. After finally getting in contact with someone who could help they want him to submit a bunch of info to them including the receipts from the Reloadit pack purchases. He told them he had paid cash to buy them because he didn’t think they would like it if they knew he had been able to buy them with a credit card. What should he do? If they knew he had purchased with a credit card would they be able to keep the money in his account? It seems like being able to buy with a credit card is not the “fault” of the purchaser. It’s the fault of the store allowing it to happen. Joe – don’t worry about legal action from Paypower. You did nothing illegal purchasing by credit card if that is the payment that the store accepted, and it is not illegal to be untruthful in their stupid interrogations either. Since you haven’t broken a law = no legal action. Just send in the receipts(even if it does look like a credit card bought it) as they are more interested in proving that you bought them and didn’t obtain them by other means. They are already well aware of the credit card game, so they already likely know you bought them with credit card anyway. Thanks for the info Cam. That was my thoughts as well. Can you share more details on your experience with them. Did you too have your account froze because of CC purchase type of activity? How did the process go of getting your money back? I had a few frozen accounts (they don’t seem to stop you from opening a new one). I had no problem getting my money back once I got through their 20-30 minute interrogations. Anyway I’m done with them. There are plenty of other prepaids out there that take reloadits. Cam, How much money worth of reloadit were you putting into these accounts each month? All from a CC? How much did you have stuck in these accounts when they were frozen? What other prepaids are you using that take reloadit? I saw AMEX reloadable cards today at Office Depot. Dont know the costs on these cards. Can they be reloaded into Bluebird? robertw: No, you can’t use the Amex reloadable prepaid cards to load bluebird. At least you can use the AMEX gift card for other expenses less the 5-6.00 cost of the gift card. Still clearing about 4X points. I got a AMX Cash Preferred and in the cash back what qualifies print it says specifically gift cards/reload cards don’t count toward rewards.. I just bought the MyVanilla Prepaid $500 Visa Card with a credit card at CVS with a $3.95 fee……..their instructions say to either sign up online or call 855-686-9513 then they send you a personalized card………What I am curious to discover is that since it does have a 10 digit code like the prepaid reload card will it load onto the Bluebird? Or can it be loaded onto the prepaid reload card and then go to the Bluebird card from there? Or can I use it to move the funds to my Amazon payments account or my Paypal account? JustSaying: No, the MyVanilla Prepaid card can’t be loaded onto Bluebird at home, but it can be loaded onto Bluebird at Walmart. Go to Walmart and ask to reload Bluebird and pay with a debit card (MyVanilla is a debit card). My husband and I already have Serve cards. I checked our accounts online and there was an option to pay bills, load with Moneypak and load with VRs. So I am confused why everyone is raving about Bluebird when Serve can also do the same stuff. I just cancelled my serve account (keeping my husband’s). I read that we should use the same email and phone number when applying for a BB, however, I am getting an error that I need to use a different email address. Maybe I should wait for 24 hours for them to remove my email address from the Serve’s system? Yes use different emails as it also helps on your amazon payments accounts………. Amex just closed my wife’s Serve account as we were speaking on the phone…….evidently they didn’t like the fact we had different last names and that we had linked a Chase Debit card issued in my name to her Serve account. We violated their terms and agreement so we now “supposedly” have a check in the mail for the remaining balance. Beginning to seem like it is just much easier to apply for a new Chase card every 20 months than to go thru the manufactured spend hassles of moving $2500 around with the neo fascist AMEX…………..
justSaying: wow, that’s too bad. That could be an advantage of Bluebird: I haven’t heard of people getting shut down with Bluebird… yet. To make the day even worse I got my 2.5k in Chase cards so off I went to Walmart on a 30 minute toll road ride…..(note to self: dumb idea, scary customers). Their ATM was “out of Order”…how convenient and then the cashier tried to reload my bluebird with no luck and the manager looked at the Chase card and said “oh no girlfriend, that’s a gift card”……so dejectedly I drove home and then for swizzles I went to Charlie Victor Sierra and was able to turn the gift cards into My Vanilla cards so come the limit date I’ll be able to rid myself of the hated gift cards…………lessons learned…..don’t cross a bridge when a virtual credit card application is more lucrative………. monacutest: I don’t know of any stores that would let you buy MoneyPaks with store cards. You might have more luck getting people to sell you Vanilla Reload cards than Moneypaks. monacutest: Serve didn’t used to have all of those capabilities. Recently it has become more like Bluebird and so I feel that they are both excellent options. Bluebird offers paper checks you can write out yourself. Serve offers the ability to load via credit card or debit card for free (to a limit). In all these stores, I got turned down for using a credit card to buy Moneypaks. Is there a way that I can just buy a store card and use that card to buy the reload cards? My Romeo India Tango Echo…….Alpha India Delta store initially declined the sale on the first scan and then I said “no, no they work with a charge” and then I rescanned the credit card and “viola” it went through……..this rejection acceptance pattern has happened every single time I have bought money Packs from them………One clerk at a different store initially rejected me and said “no credit cards” but I replied with “Oh no mam, they changed the policy and they are now allowing credit cards as I charged one just last week……please try it for me”……….after she went thru the rejection/acceptance drill then she said “oh that is really nice to know as they are constantly changing the policies and not telling us”………..now it has been two weeks in this fast moving game……but I now would say buying Chase gift cards would be a better way to load your SERVE as you can do all that virtually without the driving hassle…….IF and BIG IF the Chase Gift card has the same name as on the Gift/Debit card AND you register it so the address on the card matches the SERVE address……..these minor details…………. Hi, thanks for always replying. I just ordered two $500 Chase GC/debit. I just really wanna earn something from paying our mortgage and other bills even if it’s only 1%. so thanks!!! I saw my local CVS currently has 8 Vanilla Reload cards. could I buy all of them (pay the $3.95 fee for each card) and save it at home and reload it with my credit card later on next month? because I currently want the companion pass and have to make sure I meet the spending limit after my statement closing date in order for the points to be posted in 2014. Thanks for the reply, yes I know that, but what I meant is I want to just pay for the card ($3.95) and not load them until the beginning of January, can I do that? That’s mean I cannot stock up :(….what happen if on Dec my local CVS store out of stock of VR cards ….then I cannot meet my minimum spending….Is there any other way… can I buy gift cards and load them into my Bluebird account? If so, what kind of GC (Walmart, sears, etc) that can be loaded into BB? Thanks..
No it doesn’t…….you buy them and pay for them and then wait for the first of the month to load on your Bluebird…….rinse and repeat……..it is trading off locking up cash available versus locking up availability of VR cards………. Thank you for all your reply and help. but what kind of gift cards that can be loaded into my Bluebird? does it have to be specific gift card or any gift card can be loaded into Bluebird? The fastest and simplest way is to buy VR at your local charlie Victor Alpha drugstore…….then load them on the phone number……..painless……..make sure you order Bluebird checks and then you’ll be able to write checks up to $2000 instantly to spend the card dry……. How do I order BluebBird checks and hwo much does it cost? So I can use it as regular checkbook? Just log into your bluebird account and you should be able to find the option to order checks. They work a little differently from regular checks in that they must be pre-authorized online before they can be given to anyone. Once you preauthorize a check, the dollar value of that check is immediately taken from your account. Thanks! by the way, if I buy 2 VR cards with my Chase SW card at CVS and load it with $500 each on the same transaction on same time, same day….will it raise a flag or suspicion by Chase? I am trying to meet the minimum spending in January in order to get CP status. Anyone please kindly shed a light for my question above? thanks a lot in advance! Just wondering what is the best offer for AMEX cards out there now? I heard that they have 50k bonus points through cardmatch.com , but I didn’t see it after went through cardmatch. Also what is the best offer for SPG cards?